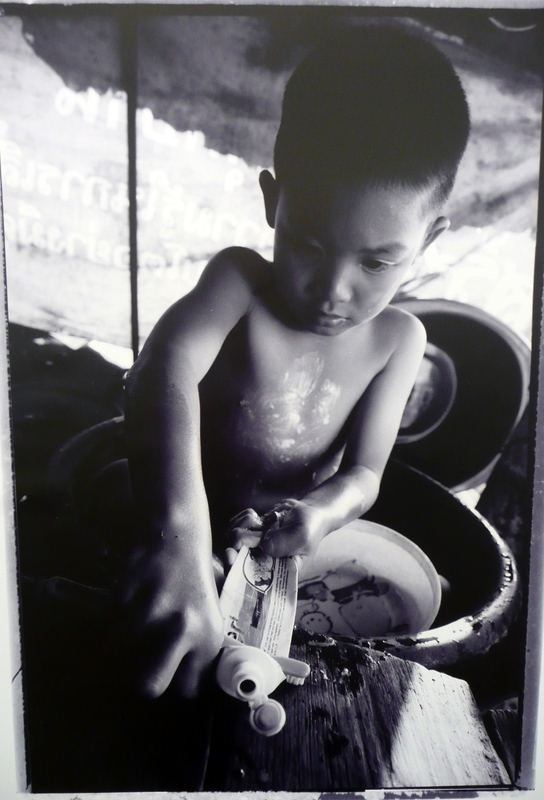 At the Paragon shopping mall there is a photo exhibit on display, the results of a nationwide contest. The contest was held on the occasion of His Majesty the King’s 80th birthday last year and the photos were judged on different themes. 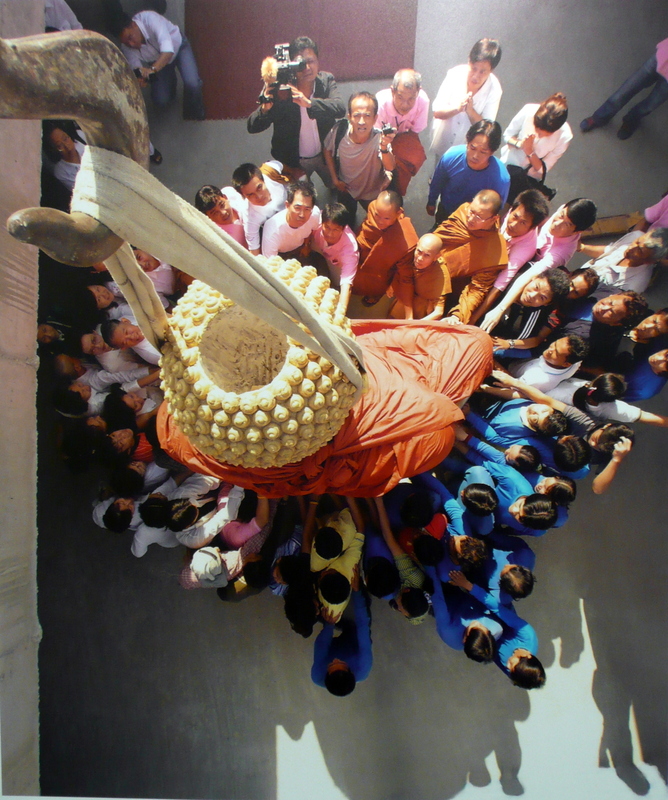 There was a category of pictures specifically honoring the Thai’s devotion to their king. Another category was of general “life in Thailand”. Another was for nature photos. The lighting wasn’t great, so I was limited as to which pictures I could capture with my camera. Here are a selection of the more interesting shots. The first two and the final one were noted finalists in the contest. This first one is particularly interesting. Titled The Father’s Son, it was selected as an example of how people take His Majesty’s “Sufficiency Economy” theory very literally – to the extent of squeezing out the final drop of toothpaste from a tube. This picture appealed to me because that’s exactly what my father taught me when I was a child, to the extent of cutting the tube open to get every last bit out. How’s that for fiscally prudent Midwestern values? 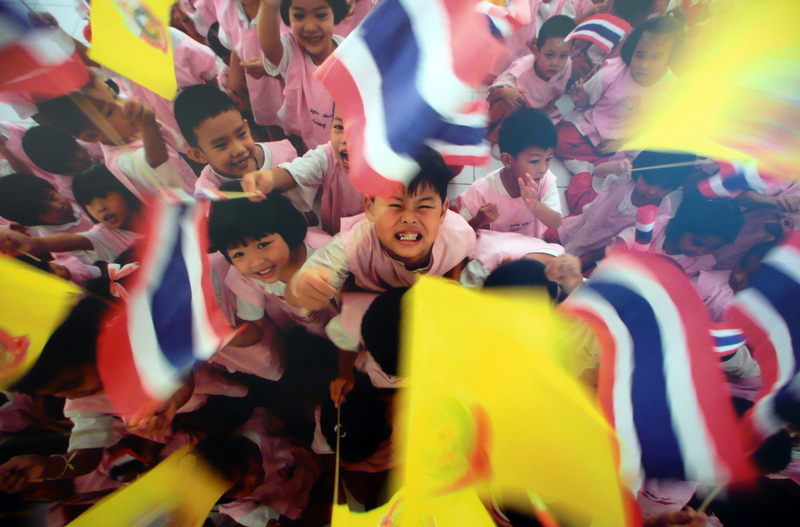 This second photo shows a gaggle of preschool / kindergarten aged children wildly waving the Thai national flag and the yellow flag of King Rama IX. Above, a special celebration around Songkhran (the Thai new year) at the largest Buddhist complex in Thailand, located on the outskirts of Khrungthep (Bangkok). 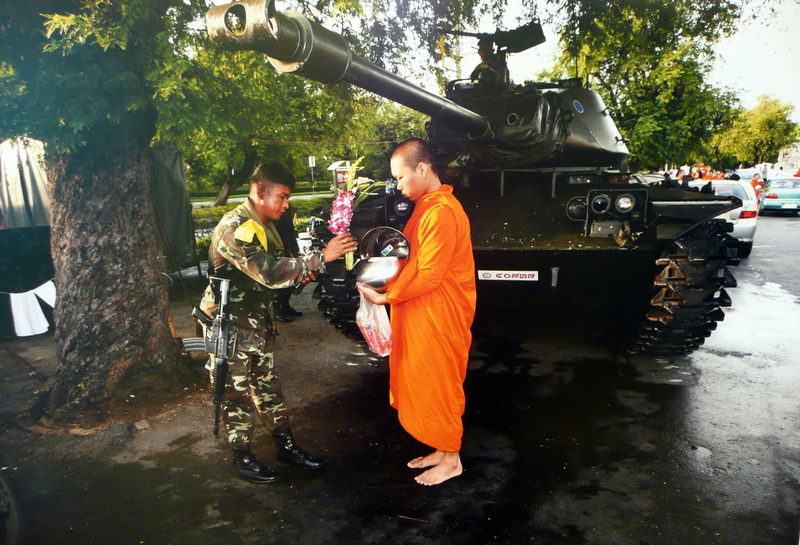 Above, a monk collecting alms from a soldier not long after the coup in September 2006. The lighting was poor, so I didn’t capture this one very well, but the actual picture is very sharp. It is taken at the installation of a new Buddha statue at a temple, where community members and workers have a “laying on” of hands during a blessing. Interesting angle. 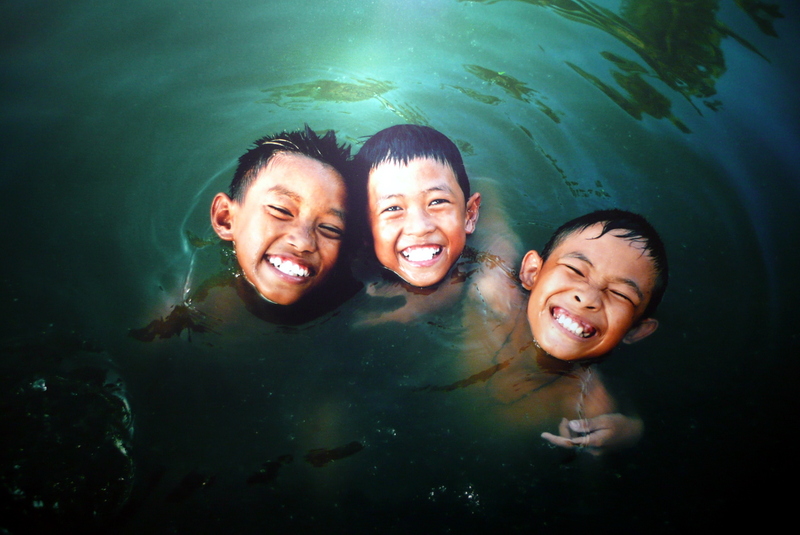 This entry was posted in Uncategorized and tagged culture, Photography, Thailand by christao408. Bookmark the permalink. Amazing photographs! Thanks for sharing. The Songkaran picture is really beautiful. I love those pictures. My dad also taught us to squeeze the toothpaste tube till it was flat! And then there’s still more when you unroll it and squeeze it back again. I still do that. 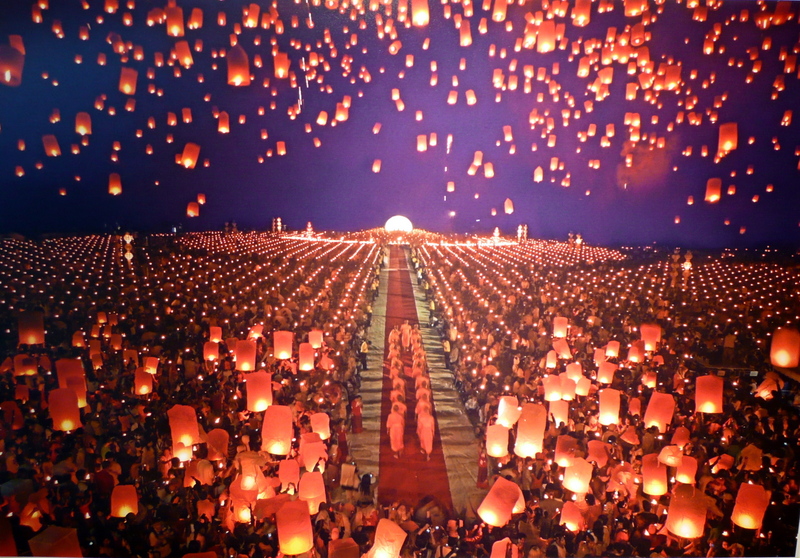 wow; there’s just something special and kind of mystical about the Thai spirit. It reminded me of a moment on my long ago trip, on a bus, with a young soldier on leave. He was pretty wasted and ranted alot, first happy, then belligerant. I began to wonder if my presence had instigated it (I hadn’t said anything, but you know the feeling you get). The feeling I perceived (telepathically??? duh), was one of complete frustration but incredible pride. I really felt for the guy and wished I’d been able to speak Thai. did you take all of these pictures?? they are amazing! they belong in a magazine!!! i especially like the first one and the songkran one. @MAXIMO – Max, sorry but I didn’t take the pictures. I just took pictures of the prints that were on display at an exhibition. I can only wish I took pictures as nicely composed as those. these pictures are amazing. they capture a lot. As always, very captivating pictures. Each of those pictures seems to talk to me. 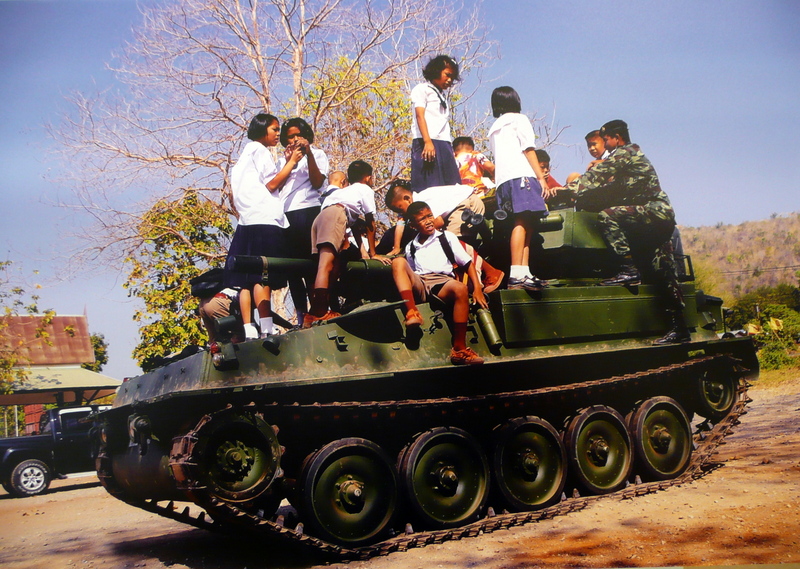 @youniversl – Thais have an interesting habit of unloading emotionally on farang. I think it is because of the pressure they are under to always be aware of their public face, so when they get a chance to talk with someone who isn’t Thai, they can be tremendously candid. The challenge is, though, that sometimes the farang mistakes that (with colleagues, aquaintences, etc.) as the signs of a close friendship. Sadly, that’s not usually the case. @socaltransplant – @Dezinerdreams – @babydot74 – @ZSA_MD – I’m glad you enjoyed the pictures. They really encapsulated a lot of the joy and contradictions I see living here; I wish they were publishing a book with the photos as it would be a wonderful addition to the coffee table. @ElusiveWords – Yes, Tawn and I have gone around and around on the toothpaste tube issue. We compromised and it is squeezed out a few times but I don’t actually cut it open anymore. Waste not, want not.